Ha. 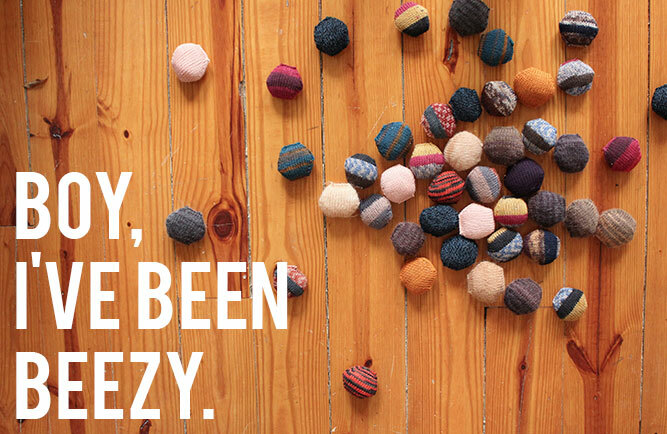 Periodically I give the random, stray pun a cozy home on Make and Do Crew. What can I say? As outcasts of the “real” world of writing, I feel sorry for puns. Plus, they make me feel so clever. So, I started this crazy project that is the Beekeeper’s Quilt Pattern three short weeks ago. 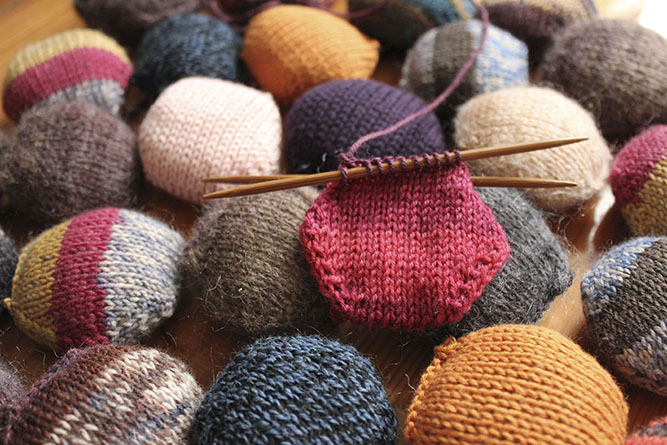 Boy, how the sock yarn flies when you’re knitting little hexagons. These little hexes, or “squishies” as I like to call them when I’m stuffing down them Mike’s shirt as I finish them, are the cocaine of crafting. I’m not sure there’s been project I’ve been so addicted to since I made lanyards in Girl Scout camp. What’s not to love about them? They’re portable, 89% mindless and each one turns out differently. To date, I’ve knit 53 of them. FIFTY-THREE!! Honestly, I’m as shocked as you are. I thought I’d be knee-deep in to three new sweaters and a scarf at this point. But there’s something perfectly appropriate about this little hexes for my perfectly short attention span. Each hex takes me about 30 minutes, which means…yup…do the math…I’ve spent 26.5 hours in the last three weeks knitting little squishy balls of yarn and batting. Yikes. And, um, kinda wow? What I read into this shocking statistic:-I’m watching entirely too much Breaking Bad and Lie To Me. 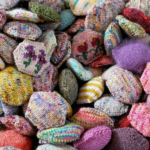 -I have filled every spare waking moment knitting these things. You might think that’s weird. And I’d have to agree with you. 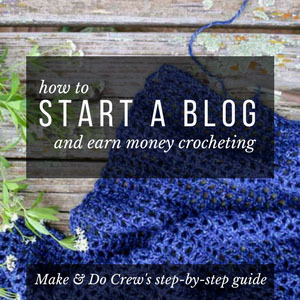 –Tiny Owl Knits has designed what might be the most pointless, yet addicting knitting pattern in the history of time. So it probably goes without saying that I’ve also obsessively been collecting sock yarn to use for this new relentless pursuit of mine. Knit Picks. Michael’s. Hancock. Hobby Lobby. Ben Franklin’s. No one’s safe. And although I love this Beekeeper’s Quilt pattern more than I can probably explain in these pixels, I’m not willing to let this project to cost a billion dollars. Unless I get a cat of an extremely rare and distinguished breed and bequeath this quilt as his noble thrown, I’m not even sure what I’ll do with the finished project. So, I need to keep it cheap-ish. With the exception of the yarn I bought on Knit Picks, I use a 40% coupon or buy the yarn on sale. 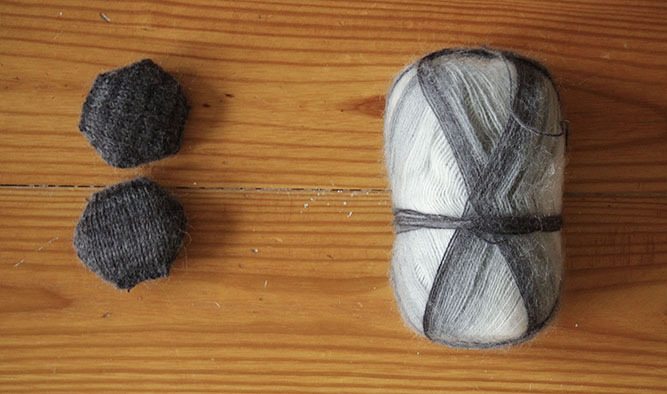 Sock yarn is inexplicably pricy, but I try to pay less than $4 for each 50g skein. So there you have it, my wooly palate as of week 3. I plan to add more yarn as I find it. (In fact, there might be a package from Joann’s arriving in the mail this week…) One thing I love about this project is that I can make it up as I go. Every time I add a new color, the chemistry of the entire blanket changes slightly. Okay, so is anyone else as obsessed with the Beekeeper’s Quilt as I am? If so, please speak up. It’s lonely in this big pile of squishies. I love YOUR ambition. The string are is sure to last a few hundred years before it decomposes. I’m sure it’s a higher payoff activity than these squishies. Hammer time! Your honeycombs look SOOOOO great! Good work you little worker bee (… get it? he…he….). I can’t wait to snuggle up next to you under this fab quilt. Oh I get it—bzzz bzzzz! How are your honeycombs these days? Started my BeeKeepers Quilt this last week after I ran across your blog. What a fun way to use up the leftover bits and bobs of previous projects. Thanks for sharing! Lynn, I’m so happy to hear you’ve joined in the madness too. It’s pretty addictive, huh? Keep me posted on your progress! Hi. I LOVE your website!!! I’m Val from Wales UK and have knitted since I was very young (never mastered crochet, though I’d love to). Recently I’ve fallen in love with a UK 100% wool yarn called Twilleys Freedom Spirit and a US yarn called Crystal Palace Taos. I’ve have made many things and have just finished an Entrelac cushion in many colours as a wedding gift for my friend. I’ve also made two other entrelac covers for squishy microbead cushions. There’s no stopping me. Next I’d like to start a beekeepers quilt and came across your site on Google. It’s amazing. Like you, I love colour and texture. Don’t suppose you have a pattern for each individual hexagon do you? Thanks for the yarn recommendations! I’ll definitely have to try those out. how do you sew them together? All the pictures and talking about what has be done and the yarm BUT no directions. Dd I miss it? 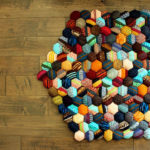 Would you recommend this beekeeper quilt for a beginner knitter, and my stash of yarns are worsted weight – Caron One Pound and Caron Super Soft. Would that yarn work. It sure would make it more economical. I’ve made a hat and now an afghan of squares. Tks G.
Truthfully you could make this project out of any type of yarn. 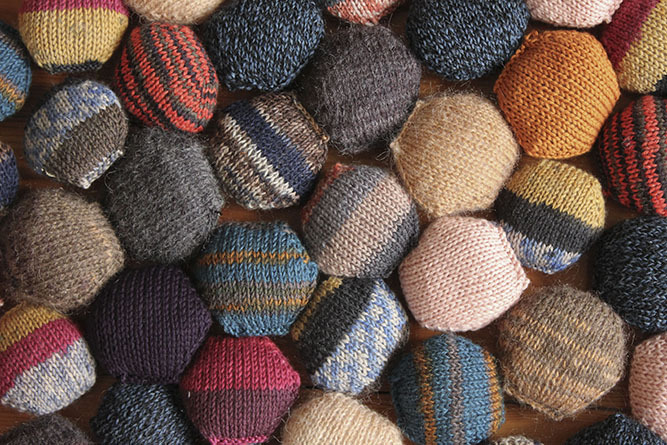 The size of yarn and needle you use will determine the size of hexipuff you get. 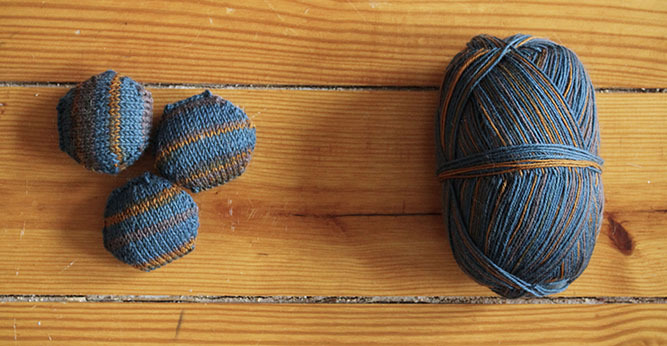 If you use worsted weight yarn and say a size 6 needle, you will have a larger hexipuff. 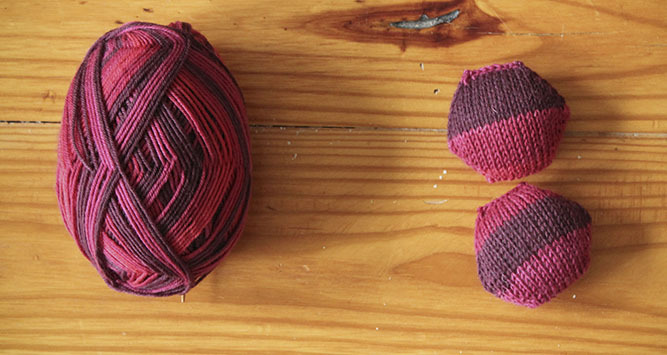 These sock yarn puffs are only a couple of inches in size. 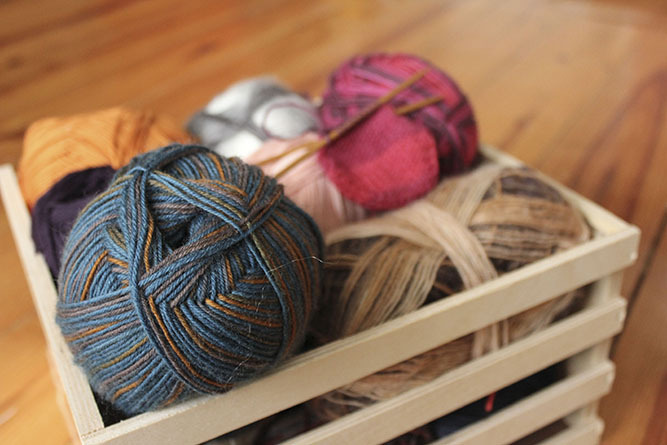 But, go for it and you are right, the yarn you have will be more economical. I also fell in love with this pattern when I discovered it. I haven’t started it yet, but after reading this I am inspired to get started, thank you! I have finally found an outlet to use all the second cuts from our alpaca stash in my garage! I was going to probably throw it out eventually, but now I can make a hypoallergenic, warm stuffed throw for my bed or couch or both!! The only thing I worry about on these kind of things is using the wool thread or stuffing and then leaving it out for the moths to chew up. Will have to remember to give it a periodic moth proof, herbal wool wash bath! Another use for these luscious puffs I think I would like to try is to make a vest out of them. Wouldn’t that be a fabuloso idea !! Any more updates on this? I just found your blog recently, and I love it 🙂 Now I’m kind of obsessed with the beekeeper’s quilt. I don’t have babies, but I think it would make a great play pad for baby’s tummy time that would eventually turn into a cat bed (as every other surface does). What is it about this pattern that is so darn catchy!? I was obsessed as soon as I found it too. I’m planning a few updates on my quilt for the coming weeks actually. Check back soon! And I think any cat or baby or baby cat would be lucky to have a Bee Keeper’s Quilt! I too am knitting the same quilt 🙂 This pattern is awesome and sooo very much addicting! Just a quick question on Patons Lace – did you knit this straight from the skein? 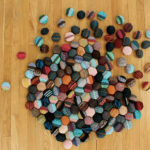 Or did you double or triple the yarn ends to keep the hexipuff sizes consistent? I’ve been using Lion Brand’s Amazing for now but I need to throw in different textures and colors to really achieve the look I’m going for! I had my eyes on this yarn at the craft store because the colors are so nice but backed away from it because the yarn is so thin! Any thoughts would be helpful, many thanks in advance! SO addicting! 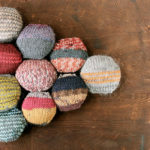 I found myself obsessed with knitting squishies! With the Patons Lace, I actually just used one strand of it. It does look super thin, but because it’s a little bit “fuzzy,” it actually fills out and creates a puff about the same size as the others. I did find that you could see the stuffing through it a little bit because the strand was thinner than the others, but it wasn’t enough to bother me. I love the colors too! I’d love to see your finished quilt. I’m getting up the gusto to sew mine together. Love, Love, Love the Beekeepers quilt. I am hooked.. It is crazy but it’s instant satisfaction. You can completed the puffs in no time at all and I found a basket that I am putting them in. It might take some time but I hope to make a cover for a double bed.. Here’s to the crazy little puffs. Ha ha, I agree! Although sometimes I think those of us who are making it are the “little crazy puffs.” I admire your ambition to cover a double bed. That will be the coziest little nest ever!